With Veeam Backup & Replication 9.5 Update 3, all traffic are encrypted with a default certificate, if you did not change it. The default certificate has are expiring after 12 month, and since it’s about 12 mount since Update 3 was released this certificate is now about to expire, and you will get this warning when opening the console. 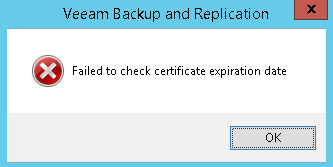 The backup will continue to work, even after the certificate has expired, but the agent management functionality, as well as all granular restores will start failing. The solution is to change the certificate, see this Veeam KB: https://www.veeam.com/kb2806 the KB har links to how to import a certificate og renew de default certificate. This will be fixed with the upcoming Update 4. Veeam, Veeam Agent for Linux, Veeam Agent for Windows, Veeam Backup and Replication Veeam, Veeam Agent for Linux, Veeam Agent for Microsoft Windows, Veeam Backup & Replication. permalink.